We were excited to be chosen as Playmobil Playologists for the second year running. The children adore Playmobil and I find all the different sets work quite well together. We were recently sent our main review toys. 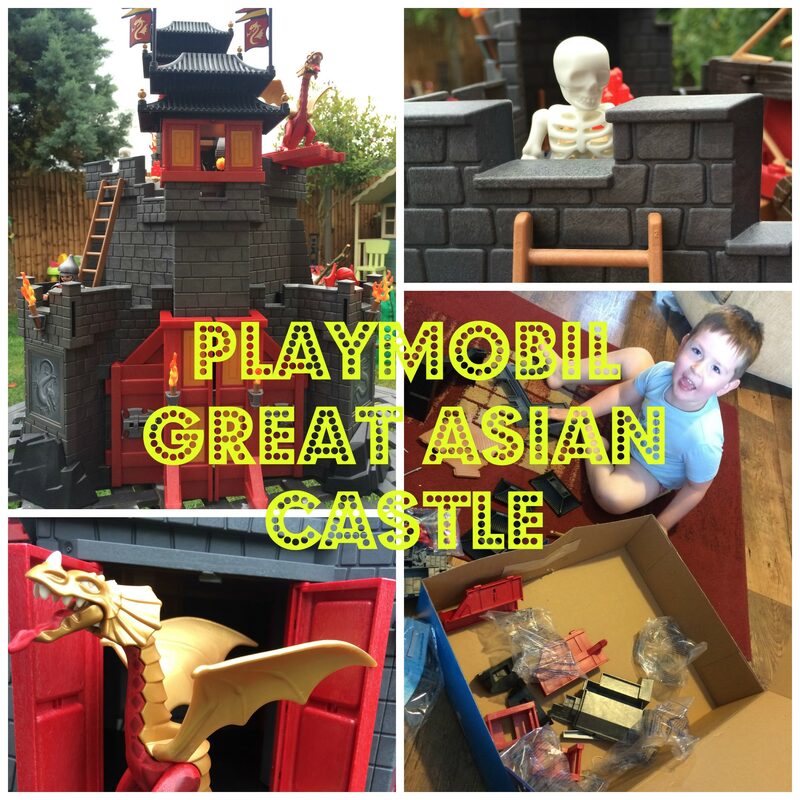 Big Brother received the amazing #5479 The Great Asian Castle from the Dragons range. This was a great set for him. It took me about an hour to put together but the instructions were clear and I only needed my husband to click together some of the larger pieces. Enemies beware! The Great Asian Castle is protected by a fierce fire-breathing dragon. When not flying around, the yellow dragon can guard the castle from the attachable landing platform. This fortified castle also includes plenty of features to help the soldiers defend it. The functioning portcullis keeps unwanted visitors out, while anyone who manages to sneak into the castle will be caught off by the hidden trapdoor. The trapdoor can also act as a secret getaway for the castle warriors. Keep enemies at bay using the functioning crossbow with flaming arrows. The rocky landscape also conceals a secret cave where kids can hide the sacred dragon fire, which lights up (batteries not included). The set also includes four figures, helmets, shields, and additional battle gear, skeleton, torches, flags, and other accessories. This is a great value toy, it’s expensive but you do get a lot for your money. This set can be upgraded with the Playmobil Secret Dragon Fort (#5480) and is compatible with the Giant Battle Dragon with LED Fire (#5482), which can hang from the castle walls by its claws. Both my children have been enjoying this set. It’s great for imaginative play and role play. There are lots of little features they love, such as the trap door and portcullis. Little Sis received the very cute #6790 Convertible Car set from the 123 range. Cruise with the top down in the Convertible Car. With a bright and colourful design and large, rounded pieces, this PLAYMOBIL 1.2.3 set is ideal for toddlers. Kids will love racing this car around the playroom floor. Set includes one figure and convertible car. This goes well with her other toys from the 123 range but I think she’s growing out of this range now. She’s nearly 3 and really enjoys playing with her brothers Playmobil and is capable of playing with more intricate and detailed sets. Playmobil is so great for imaginative play. This is a fab castle that my son would just love. Oh wow, this looks amazing. I’m a big fan of playmobil and I love all the different character sets they have. If only we had a bigger house … I’d love Santa to deliver this!